Riva del Garda is a bustling Italian town which doubles as a tourist resort, located at the northern end of Lake Garda. This is the dramatic end of the lake, with mountains rising on either side, and Riva sits comfortably on the shore, with a backdrop of lake, valley and hills. Until the lakeside road was constructed, Riva was an important port for communications along the lake's length. The town was part of Austria until 1918 and there is still something sedate and un-Italian about the streets and architecture. Nowadays it is in the Italian region of Trentino-Alto Adige, within the province of Trento. After Desenzano, Riva is the second-largest town on Lake Garda, and it has a very different atmosphere from the other lake resorts: simultaneously alive yet staid. Riva del Garda has one or two actual 'sights', but mostly it is a pleasant base where tourists can stroll along winding streets and relax in waterfront squares. The town's main lakeshore area is made up of a harbour, a park and a beach, so there is a variety of promenading on offer. Visitors should also allow some time for exploring the rest of the historic centre, set just back from the lake and protected by the town's fortress. Still enclosed by the old town gateways, the heart of Riva is an atmospheric network of tall buildings and narrow lanes. Riva has a town museum (Museo Civico) housed in its moated lakeshore castle (or fortress), the Rocca. The museum contains historical exhibits, paintings and also temporary exhibitions, which can be interesting. Alongside this sturdy fortress is a pleasant leafy park. A little tourist 'train' (trenino) starts here and does a very brief circuit of the town for those seeking more entertainment (it was full of merry pensioners when it passed). 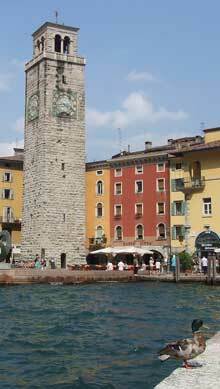 One of Riva's most striking buildings is the Torre Apponale, a tall clock-tower which dates to the thirteenth century. It looks down on Piazza III Novembre, the heart of town. The tower is open to the public, and climbing up the narrow steps is a good way to work off holiday ice-creams. There's an admission charge, and you can buy a combined ticket with the town museum. Energetic over-65s wanting to climb the tower are rewarded with free admission. It's a stiff-ish climb but the views are rewarding: the mountains and lake look pretty much as they did from ground-level, but the town and harbour are interesting seen from above, as are the various roof-tops, squares and hidden terraces of Riva. Opposite the waterfront there is a chain of cafes where you can indulge in that classic Lake Garda activity: sitting with an ice-cream or drink and watching the world go by. There are plenty of eating and drinking establishments aimed at tourists, but further back from the waterfront, amid the narrow streets of Riva, you'll find more 'normal' shops and businesses aimed at locals as well as visitors. The northern end of the lake is incredibly popular with windsurfers, who take advantage of the strong wind systems caused by the mountains and water. 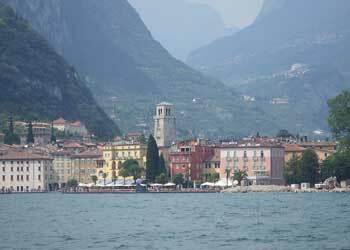 Torbole, just along the lakeshore from Riva, is the principal base for windsurfing. In Riva it is possible to hire boats, or, for a less strenuous way of enjoying the water, there is a long beach suitable for sunbathing and swimming. Walkers can enjoy easy walks around town - such as the stroll along the lake towards Torbole - or longer hikes in the mountains around. If you have a hire car, or are prepared to research the local buses (see our links on the right), you can travel into the mountains or up the valley from Riva, visiting interesting towns like nearby Arco and sights such as a waterfall a few miles to the north of Riva, the Cascata del Varone. Lake Ledro, a much smaller lake with a museum dedicated to its ancient lake-dwelling residents, makes a good excursion. 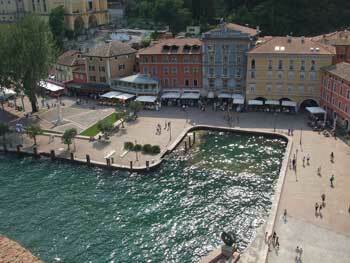 Visiting the other Lake Garda resorts is one of the principal Riva tourist activities. Both Limone and Malcesine are reachable by ferry or bus, and Malcesine gives the added option of taking the cable car up to the high ridge of Monte Baldo for views and walks. Unlike some of the little, picturesque tourist resorts on the lake, Riva del Garda is definitely a proper town. This is handy if you want to seek out 'local' shops and atmosphere, but less quaint for holiday-makers. The surrounding mountains make it a practical base for exploring the area, and the Lake Garda ferries call regularly. Since this is the very tip of the long lake, journeys to the southern lake resorts are both time-consuming and costly: if you want to visit as many lakeside towns as possible, it would be better to stay nearer the lake's centre. Although the mountains are easily accessible, Riva itself is largely built on the flat; along with the sedate atmosphere this makes it popular with older visitors, who promenade in the lakeside park. Younger travellers will find bars and the lively night-time atmosphere you'd expect in a holiday town of this size. Riva del Garda is served by the regular Lake Garda ferries, and the other northern resorts - Torbole, Limone and Malcesine - are a reasonably short boat ride away. You can buy day tickets for either the whole lake or just this northern end. If you are travelling towards the southern end of the lake, be prepared to pay extra for the fast hydrofoil services, or to relax during a very long boat ride. Riva del Garda is not quite as well-connected to Italy's transport network as the southern lake towns, but it can still be reached by public transport. There are railway stations in Desenzano and Peschiera, and from either town you can take a bus or ferry up to Riva. There are also direct buses to Riva from the nearby cities of Verona and Brescia, both of which have airports with budget flights from the UK: Brescia Airport. There is also a railway station to the east in Rovereto, which is connected to Verona by rail. In the summer there is a daily bus service to Venice for day-trippers, run by Verona firm APTV (see links panel). The journey time is between three and four hours, and Venice really merits more than a brief excursion, but if you're desperate to see the lagoon city this is an opportunity. 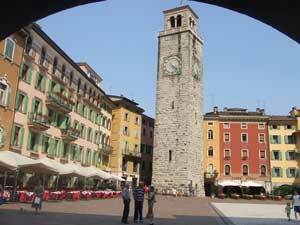 Verona, reachable by regular bus services, is a more convenient day-trip destination. There is a good choice of places to stay in Riva, from extremely smart, large hotels to boutique B&BS. Not all of the local accommodation is close to the lake, so read descriptions and reviews carefully before booking.